For this Client we built a CMS website. 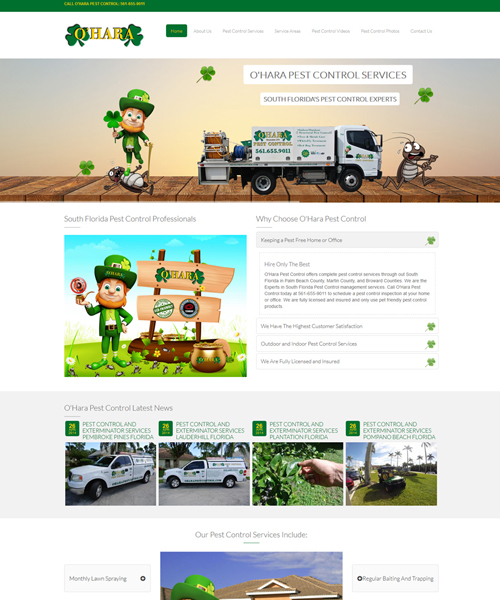 Tatem Web Design customized the Design Template to fit the company branding of O'Hara Pest Control. We set up the Dedicated hosting and host the website on our Dedicated servers. We set up email for this client. We set up a responsive based website so that the new website is compatable with all browsers and mobile devices. We designed the layout and installed a video player and company video pages and gallery pages to showcase the clients work. Tatem Web Design - We did a full CMS web site using Joomla 3.2.3 for this client's website, email , videos, photo galleries, and interactive forms. Provided client with training, we currently provide support, we manage the web hosting, email, website stats.